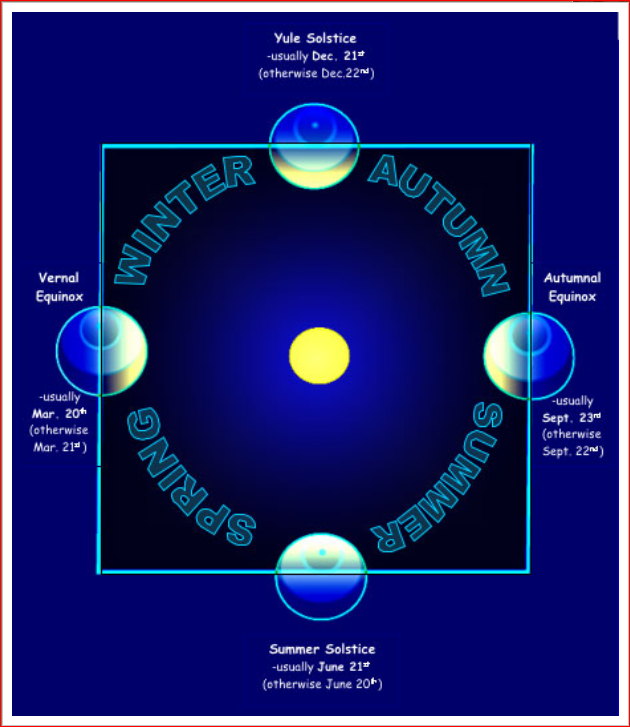 This diagram shows the position of the Earth, in relation to the Sun, at the time of the Summer Solstice, as well as the other solstice and equinoxes of the year, for Earth's Northern Hemisphere. This morning, Summer begins in the Northern Hemisphere of Earth, while at the same time, Winter begins in the Southern Hemisphere. For 2018, the season of Summer begins in Earth's Northern Hemisphere (and the season of Winter begins in the Southern Hemisphere) at the moment of the June Solstice: Thursday Morning, 2018 June 21 at 6:07 a.m. Eastern Daylight Saving Time (EDT) / 10:07 Coordinated Universal Time (UTC) (the moment of the posting of this blog-post) . In etymology, the word solstice comes from the Latin terms Sol (Sun) and sistere (to stand still). In ancient times, astronomers / astrologers / priests recognized that on one day of the year (in the Northern Hemisphere, on or near the day we now call June 21), the Sun would appear to stand-still as Sol reaches its highest point in the sky for the entire year. The motion of the Sun's apparent path in the sky (what is known astronomically, today, as the Sun's declination) would cease on this day, before appearing to reverse direction. Although the Summer months in the Northern Hemisphere are known for the year's warmest weather, the Earth is actually at the point in its orbit farthest from the Sun (astronomically known as the point of aphelion) around July 5; the Earth's closest approach to the Sun (perihelion) each year is around January 2. Hence, in general, the distance from the Earth to the Sun is not the major factor determining the heat of Summer or the cold of Winter. Solar radiation, and hence the heat from the Sun, depends on the length of daylight and the angle of the Sun above the horizon. The tilt of the planet's axis toward the Sun determines the additional and more direct solar radiation received by a planet's Northern or Southern Hemisphere, and hence, the warmer season of the respective hemisphere. While the Sun does have motions, it is actually the motion of the Earth tilted on its axis 23.43715 degrees / 23 degrees, 26 minutes, 13.7 seconds away from the plane of the ecliptic (Earth's orbital plane around the Sun), while revolving around the Sun, that causes the Earth's seasons. Hence, as the Earth arrives at the point in its orbit around the Sun, when the north polar axis is most directly inclined toward the Sun, this marks the Summer Solstice in the Northern Hemisphere and the Winter Solstice in the Southern Hemisphere. Alternately, the Winter Solstice in the Northern Hemisphere (the Winter Solstice is always on or near December 20) occurs when the Earth reaches the point in its orbit when the North Pole is most directly inclined away from the Sun. And, conversely, at this time Summer begins in the planet's Southern Hemisphere. No matter which hemisphere, the day of the Summer Solstice always has the most hours and minutes of daylight (the length of time between sunrise and sunset) for the year, while the Winter Solstice always has the least number of hours and minutes of daylight for the year. The exact number of hours and minutes of daylight, for a particular location, depends on the locale's geographic latitude on the Earth. Astronomers and long-distance radio enthusiasts, both of whom mostly depend on non-daylight hours to ply their craft, often prefer the days closer to the Winter Solstice. In ancient times, the Summer Solstice was known as Mid-Summer Day, in early calendars observed around June 24. At that time, May 1 to August 1 (i.e. the two Cross-Quarter Days) was considered the season of Summer. Such early European celebrations were pre-Christian in origin. Many will associate this ancient holiday with the famous William Shakespeare play, “A Midsummer Night's Dream.” Some speculate that the play was written for the Queen of England, to celebrate the Feast Day of Saint John. As with the Roman Catholic Church's decision to Christianize the pagan Winter Solstice festivals with the introduction of Christmas Day on December 25 (by an early calendar, December 25 was reckoned as the Winter Solstice), the Church began to associate the Mid-Summer festivals with the Nativity of Saint John the Baptist on June 24. In the Christian Bible, the Gospel of Saint Luke implies that Saint John was born six months before the birth of Jesus, although no specific birth dates are given. The most famous celebration of the Summer Solstice occurs each year at the Stonehenge pre-historic monument in England. Constructed between 3,000 B.C. and 1,600 B.C. in three phases, the actual purpose of the landmark is still unclear. However, it seems to have been associated with burials, originally. It was also used as a type of astronomical observatory, particularly for observing the Sun, which was important to help early cultures make annual decisions regarding agriculture. Stonehenge is known as a way for pre-historic peoples to mark both the Summer and Winter Solstices. From inside the monument, a viewer facing northeast can watch the Sun rise (weather-permitting) above a stone outside the main circle of rocks, known as the Heel Stone, on the day of the Summer Solstice in the Northern Hemisphere. Although today, due to serious erosion of the stones, visitors on the Summer Solstice can only walk around the landmark from a short distance away during this annual event. Although not as prominent as Stonehenge, a calendar ring using smaller rocks was also constructed at Nabta Playa in southern Egypt, perhaps as early as 7,000 years ago! As with Stonehenge, some stones aligned with sunrise on the day of the Summer Solstice. Today, a Stonehenge-like event occurs each year at the University of Wyoming (UW) Art Museum in Laramie, Wyoming, free-of-charge to the general public. At 12:00 Noon Mountain Daylight Saving Time (MDT) / 2:00 p.m. EDT / 18:00 UTC on the day of the Summer Solstice, visitors can see a single beam of sunlight shine through a solar tube in the ceiling of the UW Art Museum's Rotunda Gallery; the beam of sunlight then shines onto a 1923 Peace Silver Dollar embedded in the floor of the Museum's Rotunda Gallery. Visitors are encouraged to arrive at the museum by 11:30 a.m. MDT / 1:30 p.m. EDT / 17:30 UTC, to view this rather unique architectural feature. The bright Star Spica (Alpha Virginis), the brightest star in the Constellation Virgo the Virgin and the 16th brightest star in Earth's night sky (Apparent Visual Magnitude: + 0.97), may have helped develop another one of civilization's early calendars. A calendar of ancient Armenia used the year's first sighting of Spica in the dawn sky, a few days before the Summer Solstice, to mark the beginning of the New Year for this particular calendar. The development of this calendar somewhat coincided with the beginning of agriculture in Armenia. "Science Experiments Children & Teens Can Do At Home !" 2018 June 5. "Snowballs on the First Day of Summer!" 2015 June 21. 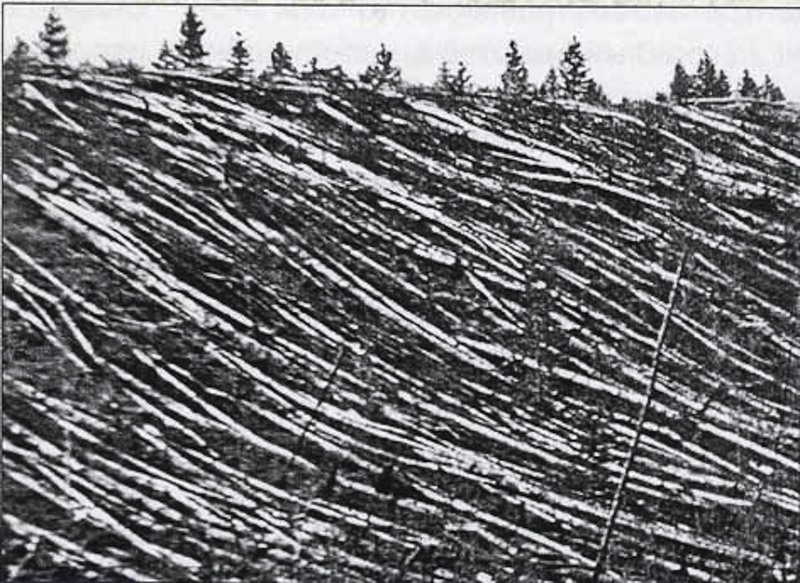 Photograph from a Soviet Academy of Science 1927 expedition led by Leonid Kulik shows hundreds of trees fallen from a huge explosion, now known as the Tunguska Event, which occurred on June 30, 110 years ago. Occurring in a remote area of Siberia near the Stony Tunguska River in 1908, no known person actually observed the explosion, which is speculated to have been caused by an air burst of a meteor, asteroid, or comet fragment. "Astronomical Calendar: 2018 May." 2018 May 1.